Kask Class Shadow 2018 Photochromatic Ski Helmet. 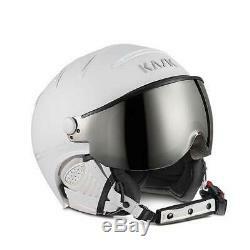 Brand new in box with Kask helmet case. Comfortable, breathable, antibacterial inner padding in merino wool, removable washable. Soft earflaps ergonomic design for best fit, anti-wind filter. The item "Kask Class Shadow 2018 Photochromatic Ski Helmet White 54cm/X Small Brand New" is in sale since Saturday, May 26, 2018. This item is in the category "Sporting Goods\Winter Sports\Clothing\Protective Gear". The seller is "skisnsuch2012" and is located in Aspen, Colorado. This item can be shipped to United States, Canada, United Kingdom, Denmark, Romania, Slovakia, Bulgaria, Czech republic, Finland, Hungary, Latvia, Lithuania, Malta, Estonia, Australia, Greece, Portugal, Cyprus, Slovenia, Japan, China, Sweden, South Korea, Indonesia, Taiwan, South africa, Thailand, Belgium, France, Hong Kong, Ireland, Netherlands, Poland, Spain, Italy, Germany, Austria, Bahamas, Israel, Mexico, New Zealand, Philippines, Singapore, Switzerland, Norway, Saudi arabia, Ukraine, United arab emirates, Qatar, Kuwait, Bahrain, Croatia, Brazil, Chile, Colombia, Costa rica, Panama, Trinidad and tobago, Guatemala, Honduras, Jamaica, Viet nam, Uruguay, Bermuda, Ecuador, Egypt, Iceland, Macao, Peru, Paraguay.